•Need to step up my game with learning Portuguese. Especially since I'll be going to Brasil early next year. I don't want L to be translator. I want to be able to communicate relatively well with friends and family. Now that I'll be running a lot less than 50 miles a week, fitting in 30-45 minutes of Portuguese Rosetta stone a day shouldn't be impossible. •I'd like to cook more. No, not heat up trader joes dishes kind of cook, but actually cut up veggies and other food stuff and cook them or bake them. This includes making more pizzas. 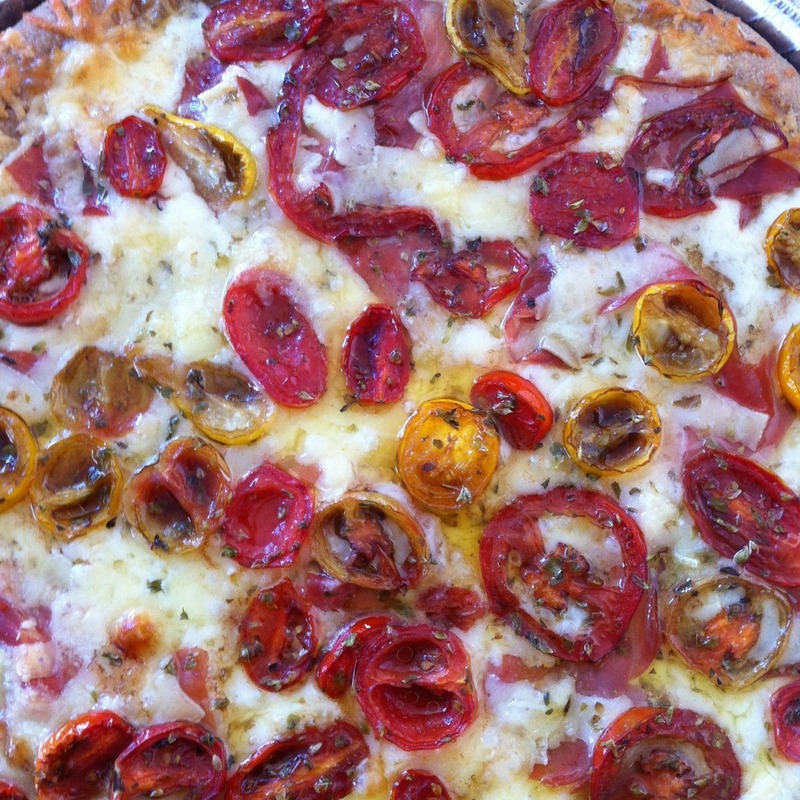 With the help of trader joes dough, it had prosciutto, heirloom tomatoes marinated in evoo and balsamic, plus 5 cheeses including gruyere. Went exceptionally well with some red Zinfandel. Yum. •I'd also like to maintain my current weight. I need to find balance with eating and working out less and not gaining back the 14 lbs I made an effort to lose during FVM training. •Obviously I've still got my eyes on a BQ. But I have until next September to achieve that for the 2014 Boston Marathon. •First, I need to nurse my ankle and possible peroneal tendon annoyance back to 100%. That might even require a trip to the doctor! Yikes! •I plan to start up the Bikram yoga again in the next few weeks. Since I won't run until the ankle is healed, bikram yoga is the next best workout for me. What's better than 90 minutes of stretching in a 105 degree environment in the middle of winter? •Core and hip strengthening are at the top of my list for this "off" season. My knees still turn in while I run. The left knee significantly more than the right. While I understand that I'll never be as graceful or as bio mechanically gifted as Meb while running (or get rid of this 100%) I do know that my hips need work. Myrtl routine and resistance bands, here I come!! It's never too early to think about this right? Along with the usual suspects like Shamrock and Rock n Roll, I'm looking at an early spring BQ attempt. Possibly at the Knoxville marathon (hilly), or some local Chicagoland area marathon. I don't like training on the lakefront during Chicago marathon season, so running and training for one of these early spring races will get me onto a secluded non crowded path and keep me a happy runner. 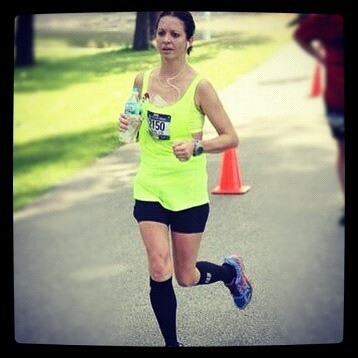 I do know that when I decide on a spring marathon I won't hesitate to hire Mrs Chicago Runner Girl as my coach again. Her custom made plan for me really worked and kept me engaged and loving running during the 14 weeks leading up to Fox Valley. Could I have trained with my own plan alone? Yes, but I doubt I would have gotten a 25 minute PR or made it to the start as prepared as I was. What are your winter goals? Have you thought about races for 2013 yet? 2 weeks until the Chicago marathon!!!!! I've been thinking about this A LOT and will most likely write a similar post about this in the coming weeks. I'm still digesting my race performance and trying to decide what I could have done differently. I've found that sometimes with marathoning, there's not much that could have been done differently. Sometimes problems just happen. I've had my fair share. Ah, so exciting that you'll be going to Brasil next year! You must be really looking forward to it! My post-marathon goals will a lot like yours - healing injuries, lots of yoga, strengthening my hips and core. And I think winter is the perfect time to play around in the kitchen! =) That pizza looks DELICIOSO, by the way. Do you have any leftovers sitting around!?!?!? I've absolutely thought about 2013 races, too. I want to do some of the Chicago staple races that I've never tried, such as the Shamrock Shuffle and the Soldier Field 10. I'd also like to go for a Disney Coast to Coast medal next year. But I'm kind of burnt out on racing right now so I do also want to be selective amongst the dozens of choices... sigh. I agree that the winter here is a great time to let ourselves heal. Races, ah. The Disney coast to coast sounds cool. I'd like to do more destination ones if the the wallet allows. Great goals! I still haven't registered for another marathon. I was hoping for a fall one, but I really just need some more time. Glad Chicago Runner Girls plan worked so good for you. I may have to bug her once I settle on my next marathon. Goals for me include not gaining winter weight and trying to eat healthy! I like just running for fun. :) keeps it fun for sure! Hmm I just found that IA one. If I don't do Knoxville, that one might be cool. Ughh, i am already spending my free time day-dreaming of spring marathons.....I have a few in mind, but i need to create some realistic goals....Post Dublin i want to focus on strength training, weight loss, and SPEED-WORK! I can't wait for you to run Dublin. That will be an amazing experience!! Are you going to run a marathon while in Brazil? Unfortunately no. I'll be there for a wedding in the middle of their sticky hot summer- hard to believe when in January here we'll be covered in snow and ice. I'll definitely make an effort to find a 5k. I'm already signed up for three races in 2013 - the F3 Half in January, Ragnar in June, and the North Country Trail Half in Michigan in August. My goal is to not race as much, so I can really focus on (and actually RACE) each race that I do. Wait, Brazil??? OMG. SO AMAZING! I hope your ankle is healing quickly! Best of luck to you and your man this weekend!